Choosing a substrate can be one of the more confusing aspects of setting up a tank for leopard geckos. There is much debate over which substrates are safe and best for your specific age and size of gecko. Paper towels, though not as attractive in a terrarium as some other options, are one of the most popular substrates available. For juveniles and hatchlings (under a year old), paper towels may be your best choice as a substrate. For adults, there are more choices available to you but with all the recommendations, making a decision can be confusing. Here's a rundown of some options you have to choose from (and some to avoid). As mentioned previously, paper towels are one of the best substrates for juvenile leopard geckos (as well as sick geckos), but they can also be used for an adult leopard gecko. With paper towels, there are no worries about ingestion or inhalation of a substrate and they are very absorbent, hygienic and easy to clean (which reduces the chance of illness). It also makes monitoring health (e.g. eating, bowel movements) easy. The downside to paper towels is that your gecko cannot burrow in them and they are not natural to their native habitats. If your gecko doesn't like to burrow and you aren't worried about a natural looking environment, consider paper towels as a substrate for your leopard gecko. Sand is where the debate over substrates gets heated. Sand is considered unsafe by some, due to the risk of ingestion and impaction (either due to accidental ingestion or intentional ingestion to meet calcium needs). 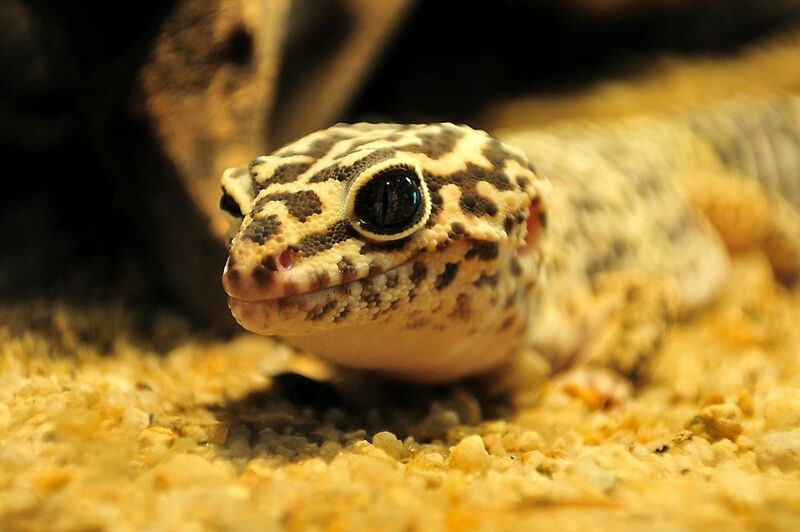 Sand ingestion is a bigger risk for juveniles so sand is not usually recommended to be used with juvenile geckos. Other potential difficulties with sand include dust (which can lead to respiratory problems), and bacterial or mold growth in wet sand. Still, some keepers prefer sand as a substrate due to the ease of scooping the waste out of it, the natural look and the ability leopard geckos have to burrow their bodies in it. Healthy adult, properly supplemented geckos are less likely to ingest sand. If you choose sand, only use it with healthy adult geckos (never juvenile geckos or sick geckos). Choose a fine-grained sand. Calcium-based sand is claimed to be digestible and thus safer, but it is digested too slowly to be considered a fail-safe option. Provide a dish of calcium supplement to help meet calcium needs (to prevent MBD). Feeding prey items in a dish can also reduce the chance of ingestion. If sand starts appearing in bowel movements you should stop using sand immediately since this is an indicator that your gecko is ingesting it. Also, monitor for signs of obstruction, which indicate the need for an urgent visit to a vet. These signs include a decreased appetite, decrease in bowel movements, lethargy and dark spots on the abdomen (impacted sand in the bowels seen through the skin). Like paper towels, paper sheets are simple but safe and make it easy to clean your leopard gecko's cage. You can get brown butcher paper or unprinted newsprint quite economically and just replace the substrate when it is soiled. Shredded paper beddings are also available and are typically safe for leopard geckos to burrow in. They don't often ingest paper bedding but if they do, the paper used gets very soft and should pass through your gecko without an issue. This is also easy to clean and carries little risk of ingestion (watch for loose threads that could possibly be ingested or trap a leg) but some carpets can be a bit rough for gecko skin (monitor your leopard gecko's belly for any redness). Keep two pieces on hand to make cleaning easier (when one is soiled, remove it for a thorough cleaning and replace it with the second piece. When the soiled one is disinfected and dry, you can just swap them out again). There are a variety of reptile bedding products available and some people use these with geckos. Some consist of small particles that could be ingested with feeding and many experts advise against them. If you choose such a substrate, take the same precautions as with sand. Crushed shells and nuts are not good options for this reason but substrates like a dirt mix or wood chips come with their own concerns. Large pieces can impale your gecko or get stuck in their mouth. Some owners use slate rocks set into a small amount of sand to anchor them and fill the spaces between the rocks. If you can get smooth flat stones, this seems like a good option for making a naturalistic environment that holds and distributes heat well without much risk of ingesting substrate (the amount of sand between the stones is less likely to be a problem than an open area of sand). Wood chips, wood shavings, corn cob, walnut shells and gravel are not appropriate choices for leopard geckos. As stated before, these substrate options come with a variety of risks.